The very concept of ‘folklore’ as it is commonly understood rests on the radically false idea that there exist `popular creations’, spontaneous products of the masses; and one can immediately see the close relationship between this way of looking at things and ‘democratic’ prejudices. As bas been quite rightly said, ‘the profound interest of all so-called popular traditions lies above all in the fact that they are not popular in origin’; and we would add that if, as is almost always the case, we are dealing with elements that are traditional in the true sense of the word, however deformed, diminished, or fragmentary they may sometimes be, and with things of real symbolic value, then their origin, far from being popular, is not even human. What may be popular is uniquely the fact of ‘survival‘ when these elements come from traditional forms that have disappeared; and in this respect the term ‘folklore’ takes en a meaning very near to that of ‘paganism”, taking the Jatter in its etymological sense and with no polemical er abusive intent. What may seem most astonishing is that, when we go to the root of the matter, the things so conserved are found to contain in a more or less veiled form a considerable body of esoteric data, that is, what is least ‘popular’ in essence, and this fact of itself suggests an explanation that we will lay out in a few words. When a traditional form is on the verse of extinction, its last representatives may very well deliberately entrust to this collective memory of which we have just spoken what would otherwise be irrevocably lost. This, in short, is the only way to save what can, at least in some measure, be saved; and, at the same time, the natural incomprehension of the masses is a sufficient guarantee that what-ever possesses an esoteric character will not be despoiled in the process but will remain as a sort of witness to the past for those in later times who may be capable of understanding it. Having said this, we see no reason without closer examination to attribute to ‘folklore’ everything that pertains to traditions other than Christianity, as though the latter alone were an exception; such seems to be Waite’s intention however when he accepts this attribution for all the ‘pre-Christian’—and especially the Celtic—elements in the Grail legends. on the one hand, this tradition may have endured longer than is com-monly believed, with a more or less bidden organization; en the other, the legends thernselves may be far older than the ‘critics’ imagine; not that there need have been texts now lost (we do not believe this any more than Waite does), but there may have been an oral transmission that lasted several centuries, which would not be at all exceptional. For our part, we see here the sign of a `conjuncture’ between two traditional forms, one ancient and the other then still new, the Celtic and the Christian, a conjuncture through which what was to be conserved of the first was, as it were, incorporated into the second, no doubt being modified in its ontward form to some extent by adaptation and assimilation, but not by transposition to another plane as Waite would have it, for there are equivalences between all regular traditions. The issue therefore is quite other than a simple question of `sources’ as understood by the erudite.lt would perhaps be difficult to specify exactly when and where this conjuncture occurred, but this has only a secondary and primarily historical interest; it is, moreover, easy to imagine that such events are unlikely to leave traces in written `documents’. Perhaps the `Celtic’ or ‘Culdean’ church merits more attention in this regard than Waite seems disposed to grant it; its very name might lead one to think so, and there is nothing improbable in the suggestion that behind this church there may have been something of a different order, no longer religious, but initiatic, for, like all that pertains to links between different traditions, what is here in question necessarily derives from the initiatic or esoterie domain. Exoterism, whether religious or not, never goes beyond the limits of the traditional form to which it properly belongs; whatever goes beyond these limits cannot belong to a `church’ as such, which can only be its external ‘support’, a point we shall have occasion to return to later. Another observation concerning symbolism more particularly here imposes itself: there are symbols that are common to the most diverse and widespread traditional forms, not as a result of `borrowings’, which would in many cases be quite impossible, but because they really belong to the primorclial tradition whence, directly or indirectly, all these forms have issued. This is precisely the case with the vase or cup. Why should what relates thereto be merely ‘folklore’ when present in ‘pre-Christian’ traditions, whereas in Christianity alone it is an essentially ‘eucharistic symbol? The assimilations envisaged by Bournouf and others like him are not to be rejected here, but rather the `naturalistic’ interpretations some have wished to impose on Christianity as on everything else, interpretations that are in fact nowhere valid. What needs to be done, then, runs exactly contrary to the procedure of Waite, who, confining himself to external and superficial explanations, which he takes on faith so long as they do not concern Christianity, sees radically different and unrelated meanings where there are only more or less multiple aspects of the same symbol or of its various applications. 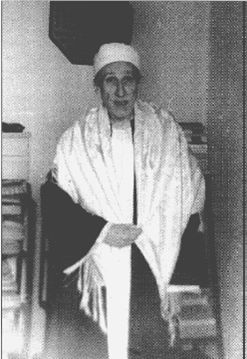 René-Jean-Marie-Joseph Guénon( 15 November 1886 – 7 January 1951), also known as ʿAbd al-Wāḥid Yaḥyá, was a French author and intellectual who remains an influential figure in the domain of metaphysics, having written on topics ranging from sacred science and traditional studies, to symbolism and initiation. During the 1920s, when Guénon was moving in the coteries of French Catholicism, he turned his attention to some aspects of Europe’s spiritual heritage. As well as numerous articles on such subjects as the Druids, the Grail, Christian symbolism, and folkloric motifs, Guénon produced several major works in this field, including The Esoterism of Dante (1925), St. Bernard (1929), and The Symbolism of the Cross (1931). Another work, – Spiritual Authority and Temporal Power(1929), was occasioned by certain contemporary controversies. The quintessential Guénon is to be found in two works that tied together some of his central themes: The Crisis of the Modern World (1927), and his masterpiece, The Reign of Quantity and the Signs of the Times (1945). The themes of these two books had been rehearsed in an earlier one, East and West (1924). The books mounted an increasingly elaborate and merciless attack on the foundations of the contemporary European world-view.